The only surefire way to stay fueled and energized in your work & life is to invest in yourself and treat yourself often. But, jumping on a plane to Hawaii for a sweet getaway might sound nearly impossible if you are low on funds or aren’t able to see past your never-ending to-do list. Between the planning, the budgeting, and the packing…oh the packing, many people opt out of using their vacation time all together in fear that just getting out the door to go vacation could bring about more unwanted stress. Vacations are great if planned properly, but we’ll talk more about vacation planning in a later post. For now, here are 6 reasons why a stay-cation should be moved to the top of your list. Checking in at a local resort for the weekend will give you something to look forward to. Research shows that having something exciting to look forward to nearby, like a getaway, will increase fell good hormones causing a boost in mood, productivity, and present awareness. A change in scenery, as simple as being in a new building, causes curiosity and in turn, can energize your mind. One of my favorite writers, Cheryl Strayed, mentions that she often checks into a local hotel every now and then to give herself a contained sacred space to let her writing flow. When we want to produce our best work, sometimes we need to get out of the rut and go somewhere new. With less planning required, you can be more spontaneous! Surprise yourself and book a one-night stay at a luxurious local resort with a pool and spa. When you lodge local, it will free up more time from planning. You get to skip the hassle of searching for a packaged vacation deal (think rental car, airfare, hotel…. the works---bundled into one) which, let’s be honest, always ends up in a rampage of FOMO (Fear of More Options). Long distant excursions require browsing tons different travel sites and reviewing a bunch of options. With a staycation, it’s a one-stop shop. Find a hotel, block off some dates and boom. No vacillation or a headache to worry about here! If you stay local, you will also, more than likely, have an idea of native dining areas to check out as well as activities to do that you never had the time to try out previously. How many times have you gone on a vacation and said to yourself, “Dang, I need a vacation after that vacation?” -haha! Money is the top cause of stress for most Americans, according to the American Psychological Association’s 2015 “Stress in America” report. If you’re not there yet financially, you can still unwind and experience luxurious ticket items, you just have to be more cognizant. Staying local has its perks and can help in this area. Be sure to ask for a resident rate when booking your room. In Florida, where local is for me, you can easily shed at least 20% off your entire stay by showing a Florida Drivers License when you checkout. Sometimes resorts will even waive valet costs and resort fees if they are aware you are a local supporting local business. It’s a win-win! So help the economy out and go on a stay-cation! With extra money being saved, you can do it a lot more frequently. If you find a resort on your stay-cation escapade that you fall in love with, you can always come back in a few months or even weeks! Heck, go the following weekend. With staying local, you may also pitch to your current employer that your next team retreat or awards gala should be done at the resort you stayed at. Next thing you know, your getting paid to take a dip in the pool and wake-up in a bathrobe with room service knocking at your door. Science also shows us that little bursts of relaxation over longer periods of time help build up endurance and keeps us motivated for longer periods of time. This is in comparison to long breaks after an extended time of hard work. 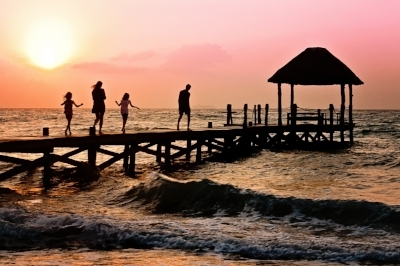 With less planning and lower costs, stay-cations allow more frequent and necessary occurrences. Even if you’re only given 2-weeks of vacation time, you could always slip in a stay-cation over the course of a weekend. Having family or friends over your house can be fun, but let’s be real, it causes for hours of clean-up after. By booking a staycation, it allows a stress-free, and mess-free way of getting together with family you might not see as much due to the busy demands of different life schedules. It also allows some time to disconnect and really lean in to your loved ones and live in the moments. Going on a spontaneous staycation also shakes things up a bit. It forces you to put down the dishes and allows you to wake up every morning not having to make your own bed. (But do human kind a favor and make sure sure to tip your hardworking cleaning staff!) Sometimes we need that. To just live and sink in our pillows without worrying that we have to re-fluff them in the morning. If you don’t have the extra help at home, some easy daily tasks such as making your own bed, become mundane over longer periods of time without a break. Give yourself a solid. Jump off this blog post for a sec. and go book a stay-cation!